Many companies have to be careful when they are hiring new employees because many employees are stealing from their employers. 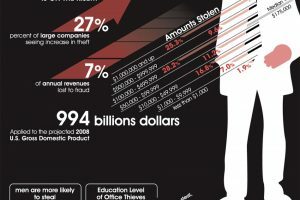 This inforagphic looks at how much companies are losing from shop lifting and employee theft. The design is good with a clean bright look. The information is in a good size text making it easy to read. I like that employee theft and shoplifting are split into two separate sections which let readers compare them easily. I like that the numbers and statistics are in red which help them to stand out. The information really does make you think twice about the employees who work for you. It shows the importance of having good people working for the company. The statistics were shocking and interesting to see just how much money companies are losing. I was not surprised by the amount of shoplifters apprehended compared to employees who stole. Good information that anyone who works for a company or small business will appreciate.